Home / kreativiti / 31 Ways to be creative, should always try and adjust. 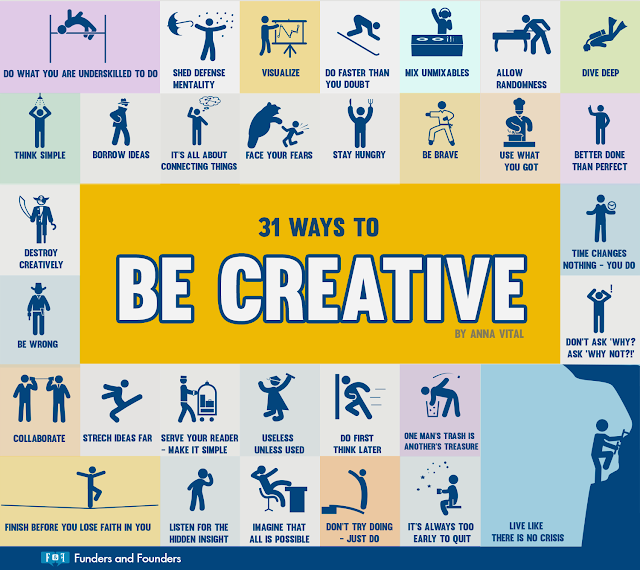 31 Ways to be creative, should always try and adjust. 1. Do what you are under-skilled to do – if you know pretty well what you are doing you are probably jaded by now. Facing a tremendous creative challenge makes you go scrambling for solutions. That’s where creativity starts – either you sink or you swim. Isaac Asimov, a legendary fiction writer who had a Ph.D. in chemistry, said that he disliked writing about chemistry. He had nothing to learn about it. Instead he wrote about astronomy and physics, subjects where he was no expert. 2. Shed defense mentality – that’s when you think your ideas are too silly and defy common sense. Most creative ideas will seem silly at first. Get used to it. 3. Visualize – the cheapest hack for how to be creative is visualizing what you are doing. Visualizing anything at all gets you half way there. Persevere. 4. Do faster than you doubt – no matter how much you motivate yourself, self-doubt will creep in. The good news is there is a window of opportunity right before it to just get something done. 5. Mix unmixables – if there are two things you like, put them together. Mixing is creating. 6. Allow randomness – randomness is free, it’s floating around in your brain anyway. How do you capture it though if that giant wall of defense mentality is in the way? Write down your thoughts in the shower. What do you think about when you have nothing to think about? That’s it. You thought it was useless mind garbage, and it turns out that’s your most creative thoughts. 7. Dive deep – when one thought leads to another and then to another, your mind is just taking you on a tour of how it works. Don’t cut it off just because it’s irrelevant. Maybe that’s a hidden insight you just don’t see yet. 8. Think simple – to figure out what you are thinking, put every though into one sentence. That’s it. If you can’t, you probably don’t know what you are thinking. Your mind may just be digesting shreds of some other dogma you heard somewhere. 9. Borrow ideas – there are no new ideas, really. But there are new combinations of old ideas. 10. Make connections – the brain works by connecting neurons. The more physical connections the better you know something. Of course you can’t hack your brain to physically connect things, but we know that just thinking about how things connect builds those physical neuron connections. 11. Face your fears – whatever you are afraid of you fear for a reason. Self-doubt, hidden potential – whatever the reason is the fear is not helping you. Once you face your fear you will get emotional about it. Channel that emotion into creating something. 12. Stay hungry – as Steve Jobs famously said. Hungry people have nothing to lose. What do you have to lose? Do you have a better path in life than being creative? 13. Be brave – creativity ruffles feathers, even offends people. True genius can scandalize. Be brave in the face of criticism. 14. Use what you got – if you just need a few more classes or just another book to read before you start – hold that thought – if you really want to create do it here and now and with what you got. And if it turns out awful – improve it. But don’t put creation off until better times. They never come. 15. Better done than perfect – get it done now, and you can always iterate later, but let it sit around because of your perfectionism, and it dies. 16. Destroy (creatively) – adding things to something is not the only way to create. Destruction is creatively in the reverse order. A bra was created by destroying the corset. 17. Be wrong – one of Einstein’s most famous papers turned out to be completely wrong as far as the science. What it did was get a few people angry enough to try to prove it wrong. They did found out how quantum mechanics really works. Don’t be afraid to be wrong. You probably will be anyway. And people might thank you for it. 18. Time changes nothing, but you do – waiting for a better time to create is a dead-end. If you want to be scientific about it, time doesn’t actually exist. So you can’t control it. What you can control is what you do with your day today. 19. Don’t ask “why?” ask “why not?” – ask why not and you will often be stumped. There is often no reason not to do something. 20. Collaborate – there is someone out there in the world right now who is thinking about the same things you are. Why put your brains together? 21. Stretch ideas – stretching your mind and ideas means pushing them to go where they don’t want to go. It hurts like doing splits. But it opens you up to new possibilities. 22. Serve your reader ( viewer, user, etc) – whatever you create it’s for someone to use. Visualize what they will see it. Make it easy on them. 23. Useless unless used – clear your mind from pseudo-knowledge – things that were imposed on you in school or elsewhere. If what you know is not helping you, let it go. It may not even be true after all. 24. Do first think later – yes, that is a reverse of the regular parental advice. The problem with thinking first is that you’ll probably talk yourself out of doing it. So better do first. Doing is creating. 25. One man’s trash is your treasure – you source of creativity might come from something others think is trivial or even worthless. Free stuff that no one wants may be your creative playground. 26. Finish before you lose faith in you – when you are about to give up you must finish first. That way after you gave up you can have a finished product for people to see. It be turn out to be a masterpiece. No one bought Van Gogh’s paintings before he killed himself. Lucky for he finished most of them before going completely mad. 27. 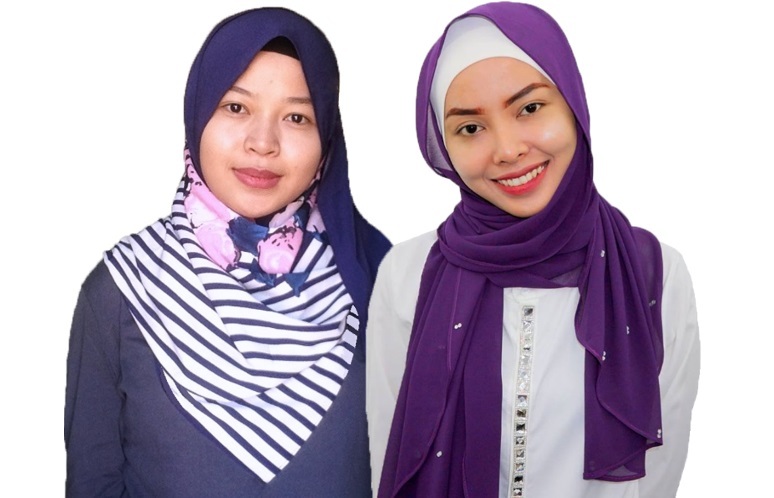 Listen for the hidden insight – creative insight is something obvious that we all take for granted, but not you because you watch closely what people say and do. 28. Imagine that all is possible – if it’s impossible now, it will probably be possible in the future. Don’t let perceived impossibility stop you. 29. Don’t try doing – just do. Master Yoda said this right – there is no try. Whatever you do counts just because you are actually doing it. 30. It’s always to early to quit – quitting means stop doing. That’s not an option for creators. You have to keep at it. You’ve got no other choice. No one is going to do it for you. It will never get itself done. Keep going. 31. Live like there is no crisis – this last one is my personal mantra. Honestly, there is always someone around you to conjure up a crisis. The news, your family, your boss, your landlord can make you feel like there is a crisis going on and the last thing you can afford right now is to sit calmly and do something. Resist that feeling. Most of the time there is no crisis. And even if there was, so what? Create despite the crisis, just like many did during the war. When Einstein came to California, an earthquake struck. Lost in his thought, he didn’t even notice. (but only after you tell me which one of these works best for you).